Running a photo booth business is a great way to make money and build a profitable business in the new year and onward. 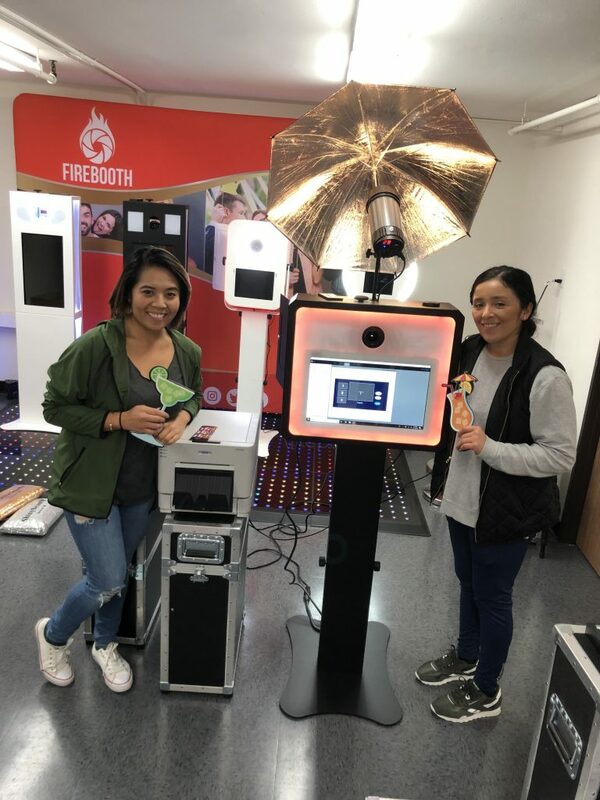 Even though photo booths are not new, the rise in online marketing means that it has never been easier to get the word out about your business, build a brand, get more clients and earn more money. The importance of your website to your business cannot be overstated, Your site is the virtual front door of your business, and it will play a significant role in increasing or reducing how many people visit your business (online and offline) and how many of them eventually convert into customers. Also, be sure that your website is mobile responsive in all areas and across all its features. People searching for information from their mobiles now surpass those doing so from PCs. As a result, search engines now have a “mobile first” policy, meaning that if your website isn’t optimized for viewing on mobile, it won’t rank very high. Consult a web developer, and you might find out that the costs are much less than expected. For many people, simply changing your theme to one that’s pre-optimized for mobile is all that’ll be necessary. Social media is where everything is happening nowadays. The different platforms offer a great opportunity to easily share content with your target audience. Apart from sharing content, it’s also easy to interact with your customers or prospects directly, giving you an opportunity to provide top-notch customer service which will, in turn, lead to customer loyalty, return business and referrals. Use all the tools at your disposal to make the most of your photo booth marketing efforts on social media. For instance, keep an eye out for events in your locality and reach out to the organizers with a pitch about your services. 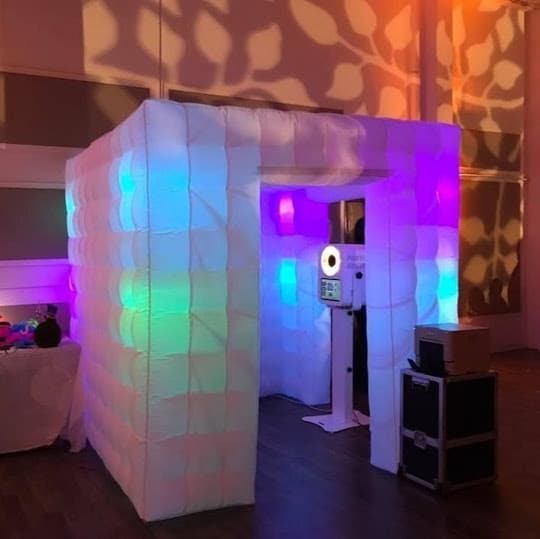 Most platforms allow you to send a private message, so use that to explain how having a photo booth at their event will benefit them. Ads are great for getting your content in front of people who would ordinarily not see them. Facebook, Instagram, and Twitter are particularly great for running ads to boost your sales. Be sure to target narrow audiences by using hashtags, demographics, and interests (upcoming events, event organizing, weddings, etc.) That way, you’ll get more conversions since the people seeing your ads will be those who already need your services. Email marketing has always ranked high among digital marketing channels. 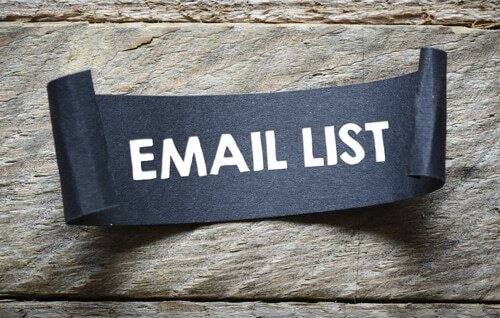 More than 85% of adult internet users in the US use their emails regularly, and the conversion rate for email marketing has been reported by many studies to be higher than even search marketing. 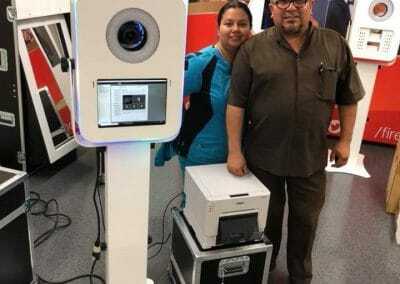 So how do you plug into the trend to boost your photo booth business? The first step is to begin to collect emails from customers and photo booth users (especially if you use photo booths with integrated digital delivery features) and then compile them in an email marketing software. You can then send regular newsletters containing valuable content and occasionally include company announcements or special offers to encourage the recipients to get in touch to hire a photo booth. You’ll need to be mindful of data regulations though, to stay on the right side of the law. Also, getting a professional copywriter to write the emails is likely to increase their quality and effectiveness significantly. Even though it might seem like quite a bit of hassle, bear in mind that this channel will get you right into the inboxes of potential customers. Although digital marketing is a more innovative strategy to reach more customers, physical networking remains an invaluable way to get the word out about your business. It’s easier to make a great, memorable impression in person, making it more likely that you can develop a strong relationship which will later lead to doing business together. Eventbrite and Facebook are good tools for finding suitable events which you can attend. While there, be sure to mingle and speak to as many people as possible. Business cards are going to be very useful too – print some and give them out to likely prospects. The cards will give some more substance to ( and encourage them to remember) the interaction in the minds of the people you speak to, and if they are of really good quality, it’ll raise the profile of your business too. Sponsoring events is another thing you should consider. 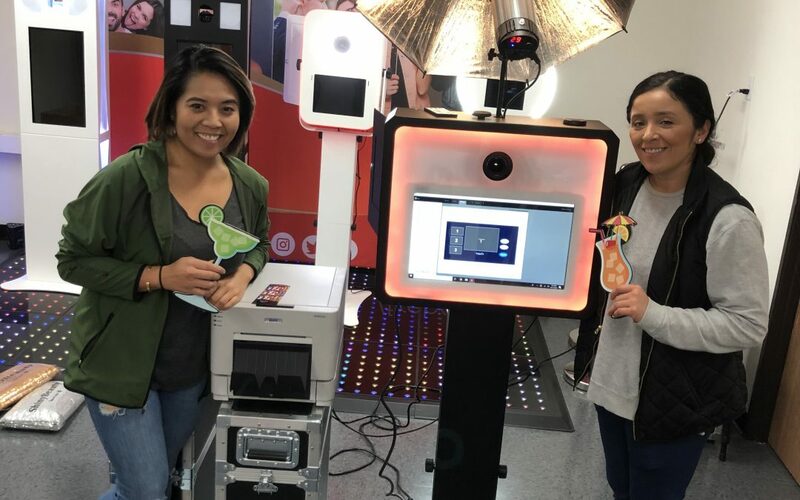 Partnering with the organizers of an event to have your photo booth at their event for a minimal or no fee might not seem to be a good idea, but it can be very beneficial if done right. If you negotiate for your brand to be highlighted on the promo materials and social media, you’ll be getting quite a lot of visibility and valuable leads. You’ll need to thoroughly gauge the events and the participants to see which ones are likely to result in enough ROI. Customer service is not a marketing channel per se, but it’s a very crucial factor in boosting the effectiveness of your overall strategy for marketing your photo booth business. From the initial contact to arriving at an event and coordinating things for the client to have a stellar experience, satisfying the customer must be your driving purpose. Even where you have to go over and above or incur some extra costs, leaving a great impression always brings immense ROI. Even a handful of customer recommendations on social media or business review sites can bring in more business than any amount of marketing you could do yourself. 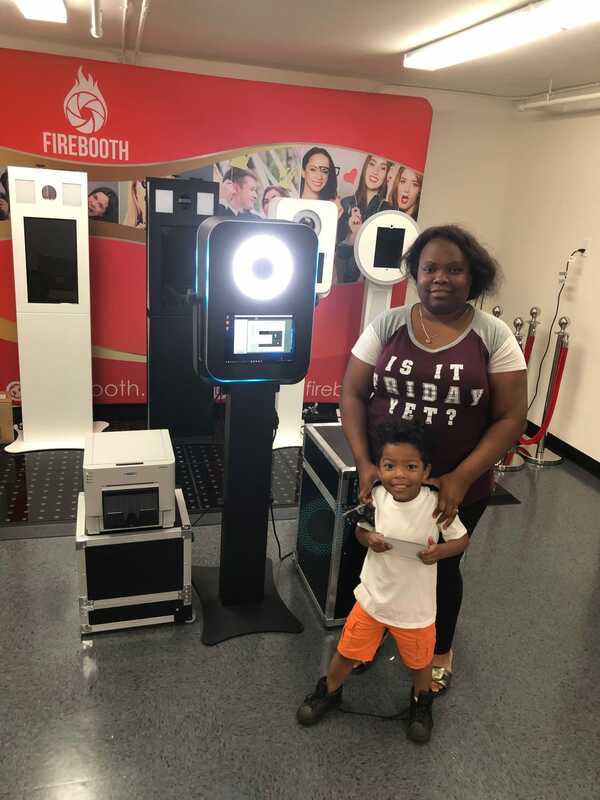 In all, it’s clear that there are a variety of opportunities open to photo booth businesses looking to increase their customer base and boost revenues this year. All of them are actionable and effective, but you’ll need to consider which ones are most suitable for your particular business and location. Afterward, implement, test and iterate as necessary to maximize. Are you strapped for cash? Maybe you need a little side income for some of your financial goals. There are plenty of reasons why you want to make a little extra money. If it’s for a side hustle or a full time business, finding something that has the right amount of demand and profitability can change your life. You will be in control of your finances and your time. Your future depends on where you want it to go and how hard you are willing to work for it. None of this can happen without the right product and business. Did you know thousands of people have benefited from their photo booth business? It’s the perfect gig. You provide value to events and attendees with an opportunity to make fun memories. If you want an easy solution, then this article isn’t for you. But if you are willing to work smart and use innovative technology and strategies to succeed… you’ve come to the right place. Great entrepreneurs ask great questions. Here are some things you should know to get a head start on the photo booth market. 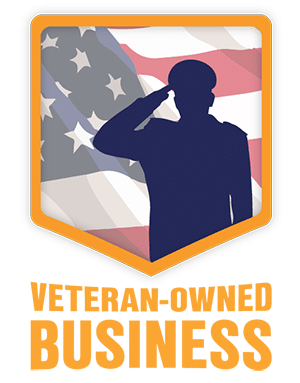 There are plenty of businesses you can start. But from what we’ve learned from economic history is that when something’s hot, there’s an incredible opportunity to ride the momentum. 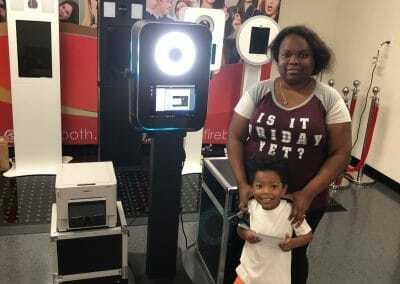 Photo booths have become a big part of demand because of the booming event industry. Think about it. Weddings are becoming more grandiose and expensive each year. People are throwing parties for every special moment fueled by the rise and satisfaction of Instagram and social media. People want memories and they want everyone to know about it. The photo booth business is riding the wave and will continue to get bigger as the years go on. With as little as $200 a month, the barrier of entry is low for equipment. You can expect high margins with a small initial investment. It’s a great time to be in the business. The cost is relatively low. Once you have your booth, you just have to buy props and accessories that compliment it. Make sure you have a vehicle that can transport everything. After that, it’s more about a marketing budget and low operational costs. What do I do to attract more clients? The best way to get more events is being remarkable. That means finding creative ways to decorate and operate your booth. It also means capturing moments on social media. Remember, people don’t use your photo booth for the pictures… they do it for the memories. Market that experience and you will gain interest. Take full advantage of community events and networking opportunities. Your business will grow heavily on referrals and through your relationships. Consider adding “friend” discounts by telling your previous clients that if they refer them to a friend, he/she will get a percentage off. People love knowing they can help out those they care about. It depends on how much what you want. Do you want to have a side business and do it occasionally, or grow it to something big? Either way, you can measure your expectations on a per event basis. If you have a lot of competition, you can earn $500-$800 dollars an event. If you are one of the few in your area, you can charge a thousand and upwards. Remember, this estimate is based on running a one-man operation business with one booth. If you have more than one booth with others working for you, the earnings are limitless. Follow us on FireBooth.com and sign up for our email list. We are dedicated to providing you with the value and resources you need to run a successful photo booth business. We believe in you. Are you looking for great entertainment options for your event? DJ’s, food, and activities are all important for a good fun event. Today, the hottest thing out there is photo booths. It’s affordable and creates a fun atmosphere for your party. Photo booths give you dozens of benefits for your event. You might be wanting to throw a party or event for yourself, or perhaps you need it for your business. Either way, photo booths offer a vast amount of opportunities and perks for your event and the people around you. Here are some reasons why you can (and should) rent a Photo Booth. Photo booths can be rented for about $500-$800 depending on where you live. That’s a great deal! Think about all the costs it takes to have a wedding or have a DJ for a local event. It isn’t cheap. Photo booths add significant value to your event and it’s at a great cost. Have you ever been to a party that feels terribly awkward? You get there and everyone is talking amongst themselves in small clusters. The mood is weird and nothing seems to spark. Those are the ingredients to a horrible party. When you rent a photo booth, you don’t have to worry about getting the right vibe going for your event. Photo booths encourage people to lower their guards. They wear funny props and make silly faces. When a group of people are getting a picture and setting up props, everyone in line is laughing and getting in on it together. It’s a great way to promote a positive energy for your event! If you have any experience throwing an event, you know what this means. Sure, you can hire a professional to handle photography or DJ the music. But there is always that part of you that feels you need to pay attention and make sure it goes exactly how you like it. With photo booths, you have someone dedicated to the activity. The best part about it is the natural way it goes. They are there to assist. The attendees take the kind of picture they want, the why they like it. You can trust that person will do a great job and leave the worrying up to him/her. Congrats 🎉 to Cecilia on starting her new Photo Booth business! Thanks for stopping by our new showroom. 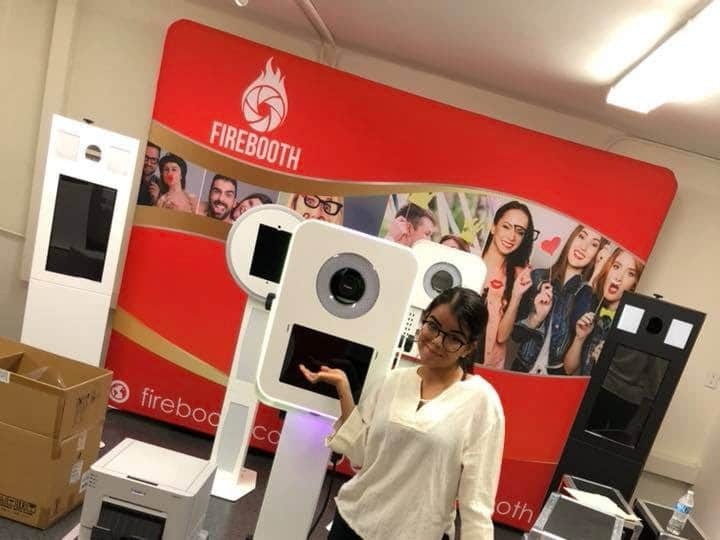 Welcome to the FireBooth family! 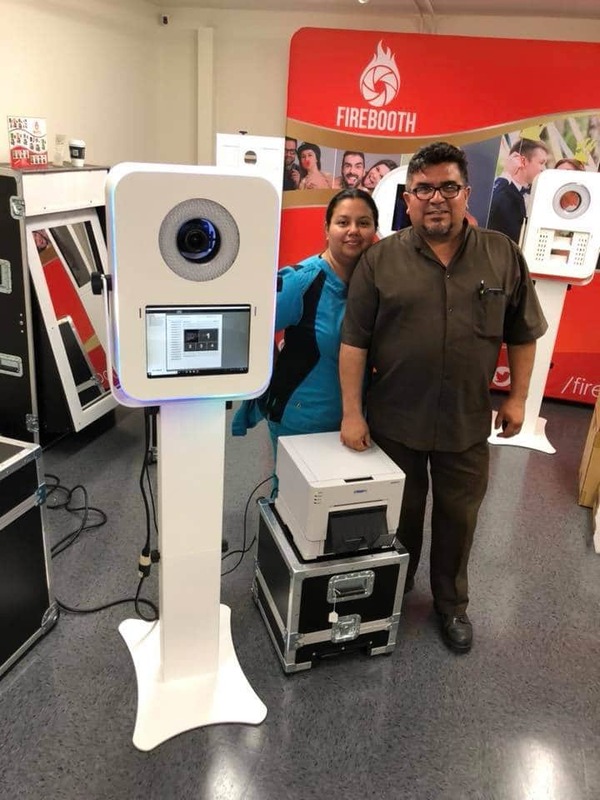 Congrats 🎉 to Felipe and Maria on purchasing their new Sol LED Photo Booth. We wish you much success with your new photo booth business! Welcome to the FireBooth family! Let’s face it. It doesn’t happen if it isn’t posted. You want to be able to share your experience with everyone you know. You also want the people around you to be able to do the same thing at your event. Photo booths encourage social media posts. Whether it’s in the actual booth, or someone takes a picture of their photo strip, they won’t be able to help themselves. If you are running an event that needs a little public relation like for charity or a business, this is the perfect opportunity! By far, the best part of renting a photo booth is the memories that will last for years. Your friends and attendees will save those pictures on their phones or in a scrapbook. It makes the experience tangible. When you think about it, very few things in an event can capture a memory. The music can’t. Neither can the food. The only things that will capture it are video and photography. But even with those two mediums, it’s hard to get true raw emotion. In a photo booth, everyone is themselves. Their goofy, fun, and all their walls are gone. You can’t put a price on that. Those are some reasons why you should rent a photo booth! It’s affordable and offers priceless perks. The next time you have an event, put it on top of your list. Are you interested in starting a photo booth business? 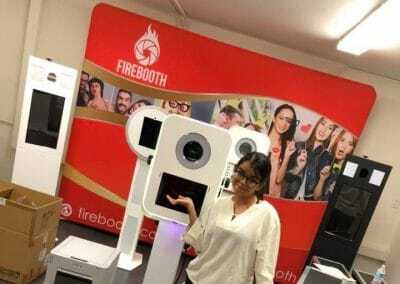 FireBooth.com offers modern photo booths designed with innovative technology at an affordable cost. Find out more today. Facebook pioneered the social media revolution and it has changed everything about our economy. It’s amazing to see how far it has come! Facebook has also evolved as the engine of marketing, allowing us to reach people like never before, all at an affordable price. Facebook has two billion active users. That’s almost 1/4 of the entire world population. To reach numbers like that in the past, we would’ve had to spend millions upon millions of dollars through TV ads or an impossible amount of direct marketing ads. Times have changed and it’s up to us to know how we can take advantage of it. 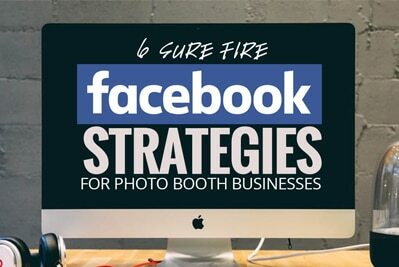 Here are 6 Sure Fire Facebook Strategies for your photo booth business. There are millions of Facebook pages. But the most important thing for each user is relevance. Does the content you post make sense and add a benefit to their lives? If it does, then you will grow your following. 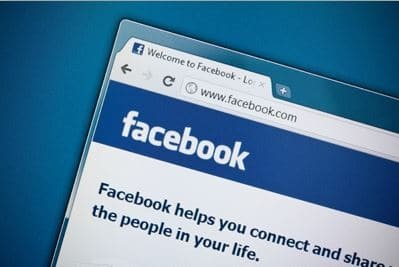 Your Facebook is like building a reputation and brand in a local community. When people see you are providing valuable content, they will buy into what you have. Not only will they begin to trust you and what you represent, but they will also tell others about you. Create something that your followers would want to share with their friends. It’s free marketing. It also works as Word-of-Mouth, and we all know how valuable (and priceless) that is. 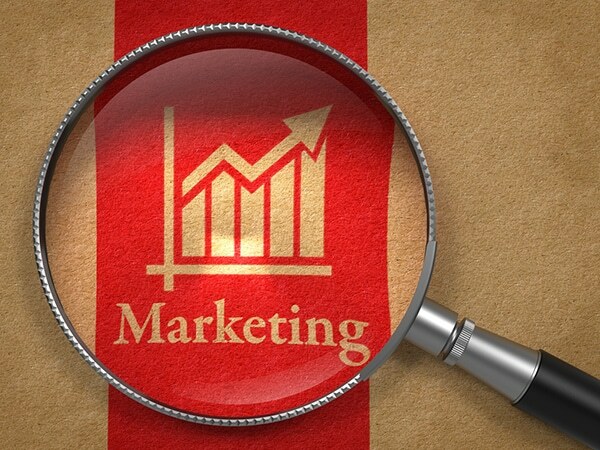 Marketing is important but it can be hard to measure. That’s why any kind of tool that you can find that measures is so important. When it comes to this, Facebook is a goldmine. It provides analytics and the tools necessary to measure your impact and reach. Once you have 30 people to like your page, you will gain access to these tools. It will inform you of new page likes, post reach, clicks, and other forms of engagement. This will allow you to test different strategies, measure them, and adjust for more effectiveness. All your hard work in reaching out to people and building their trust, boils down to how much you care. People can notice right away if someone is authentic or not. When a potential customer or client reaches out to you about your photo booth business, respond in a timely manner with a good answer or follow up information. When they give you feedback, respond gracefully whether it’s good or bad. You can’t run a business without relationships. Be there when they need it and you will see your investment grow over time. Nobody really likes formal. Yeah, they might have to be formal in a political or professional setting, but it’s hard to win people over when you have a wall in-between. Be yourself and be as friendly as you can. No one wants to read a sales pitch on Facebook, so be honest and tell them about the fun and great things you are doing. This is especially important with images. Don’t take material that doesn’t belong to you. Try to credit the people you work with. A great source for royalty free images is Unsplash. Treat others like you would be treated in your business. It’s important to be relevant but that doesn’t mean to overdo it. Your purpose online is to let people know you are out there and you have something of value for them. If you start posting a lot, they will see you as a spammer and that’s not good. All it takes is a couple posts a day to reach your followers. These are some steps and strategies to take when using Facebook for your photo booth business. Social media can change your business. It’s effective and great for brand growth. Don’t miss out on one of the most innovative business tools in history.